Last week I was at a workshop unlike the usual meetings I attend. This one was called “Communication & Impact for Female Early Career Researchers”. Firstly I should apologise to one of the course instructors, Claire Ainsworth, as I’ve already broken one of the first rules we learnt during the course, that is that a story should be timely. All I can say is that since returning back to the office at the beginning of this week, I’ve been swamped and I didn’t get a chance to sit and write until now (let’s not even talk about the two-week old, half-written post about a Higgs conference I went to that is still sitting in my draft folder!). I was really excited when I was accepted onto this programme, as it covered many topics on how to communicate my research, both academically and to the public. 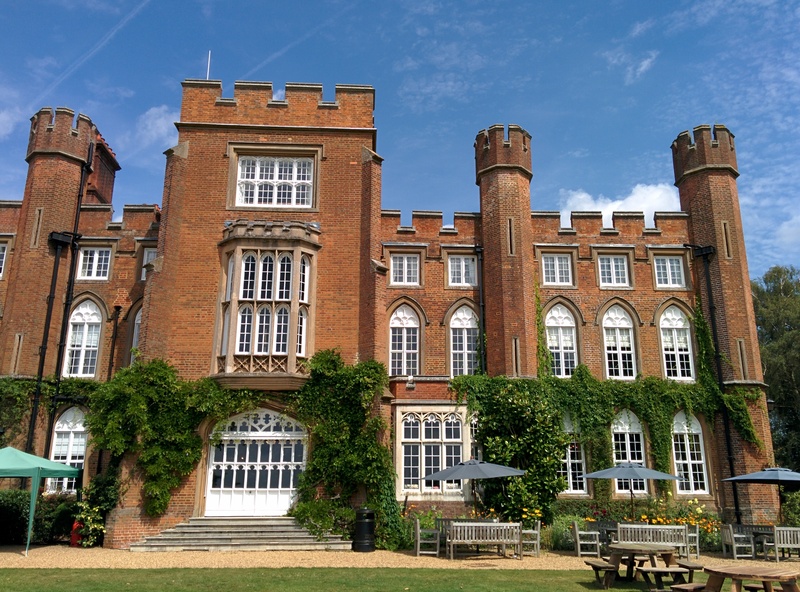 It was also set at the beautiful Cumberland Lodge in the south of the UK, which didn’t hurt. 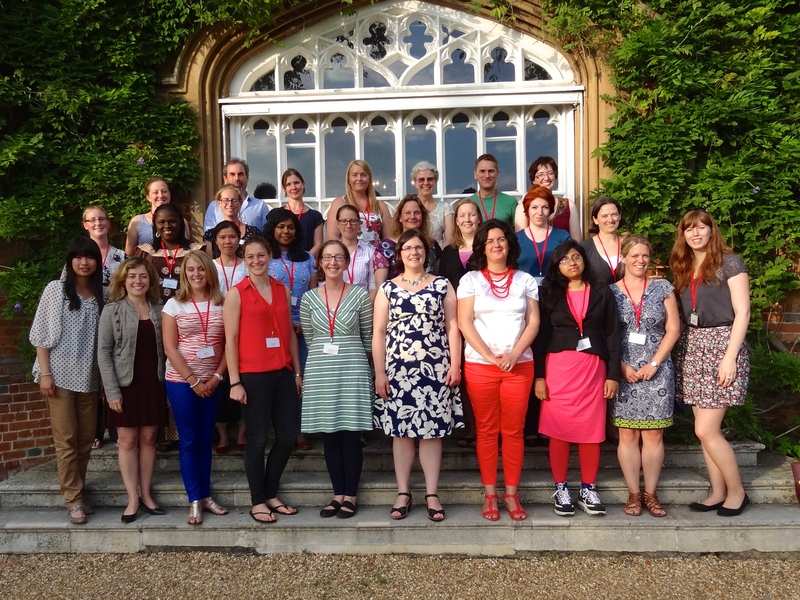 The course was specifically for female postdocs, with a wide range of scientific research areas represented, and I was able to learn from the experiences of my course mates as well as the instructors. Cumberland Lodge, the beautiful setting for the course. Before the course started we were split into four groups to begin preparation on a radio programme that we would record at the BBC on the last day of the course. I found myself a minority in my group, most of whom had a link to biomedical research in someway, and the topic for our radio show quickly became ‘medical drugs’, something I’m certainly not an expert in! I was apprehensive at first and worried that I wouldn’t be able to contribute to the show, but my group were fantastic and we found a way to get everyone involved. Indeed, since I ended up being a presenter for the show, it was more realistic that I wasn’t a specialist in the subject. We all arrived on the Wednesday evening and immediately got stuck in with a talk from the Royal Society of Chemistry publishing group about the process of publishing in a journal. This was very useful information, since it is only after the repeated process of submitting scientific articles (and getting them rejected) that you really begin to understand some of what happens behind the scenes when a paper is publish. After a visit to the bar to get to know everyone better (although sticking to tea since I was recovering from food-poisioning the day before), I went to my room to find out who I would be sharing with. I naively expected everyone on the course to be from a UK institute, so I was surprised to hear that my roommate, Chinyere, had travelled all the way from Nigeria to take part. Indeed, this was her first international trip! It was interesting to hear about her experiences setting up science communication events in Nigeria and we discussed ways that we could do something related to particle physics / CERN. Already the networking aspect of the course was working! Late in the afternoon, the two halves of the course switched and we went to work with Gareth Mitchell (a BBC radio presenter for the popular show, Click) and Robert Sternberg to learn about broadcast media. After an introduction to the topic, we were given scientific news items and sent out to record something for tv and radio. Our topic was a pancreatic cancer trial, given to us because it fit well with the expertise of most of the group (while I looked enviously at the Mars mission the other group were given, not even knowing that antimatter was the topic for a group in the morning session!). My task was to be director / camera operator for the television segment and I was able to draw on my experiences with Decay here. At the end of the day, before dinner and just before we lost the sunshine, we took a group photo! Students and instructors from the 2014 course. The morning of day two was spent editing our radio and TV items with Gareth and Robert. We learnt a lot of behind-the-scenes tricks, including how to make people sound eloquent on the radio by taking all of the ums and ahs out (in fact, with a little practice with the software, you can pretty much make people say whatever you like!). 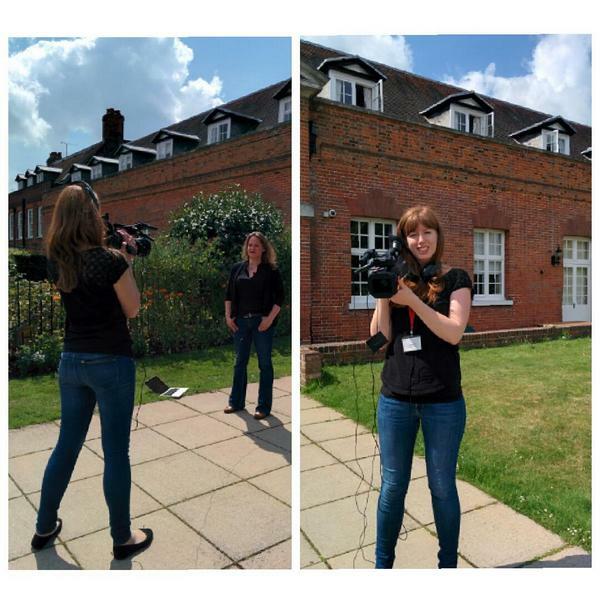 We were missing a shot of our reporter summarising the story to end our television segment with, so we had to quickly run out and grab that footage. Grabbing a last minute piece-to-camera for the end of our television segment on pancreatic cancer. 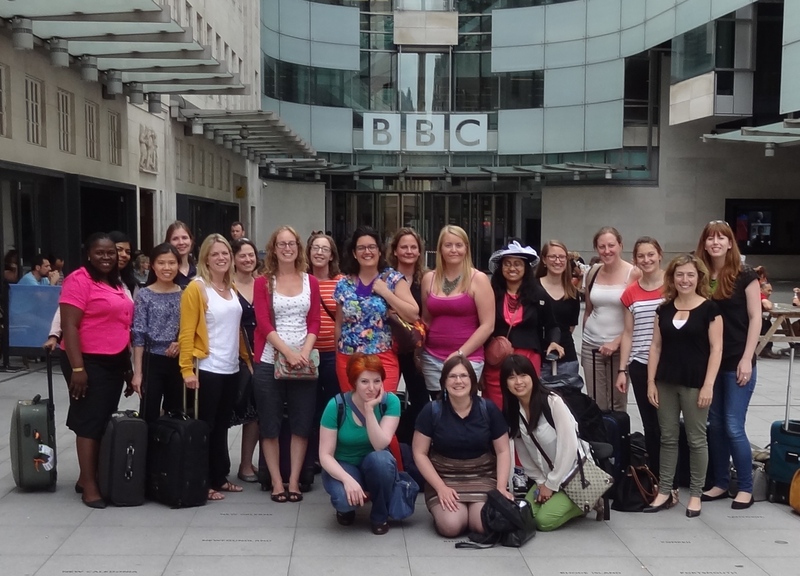 In the afternoon we watched / listened to all of the recorded pieces, and then it was off to BBC Broadcasting House! Ready to go into the BBC to record our radio shows! I didn’t realise how excited I would be to visit the BBC, but it was a lot of fun, and that’s even before we got into the studio! We watched Fiona Bruce present the evening news and had a look around some of the different areas. Recording our show was brilliant and we tried to stick closely to the 20 minutes allotted time. Presenting is hard, especially when our producer, Connie, told us we still had a minute and a half to fill at the end. We finished at 19 minutes 50 seconds, which Gareth said was pretty good! 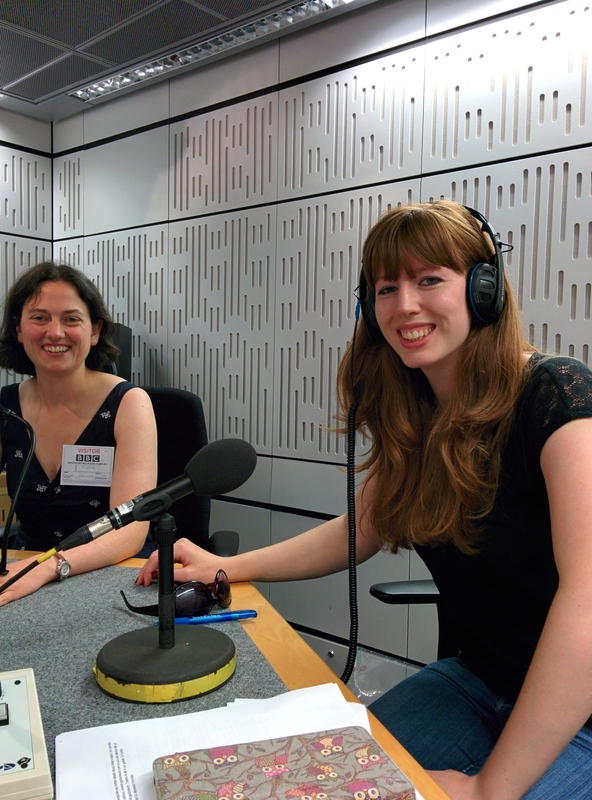 Presenter Clara Nellist with expert guest, Esther Robinson, ready to record our radio show at the BBC! To sum up, the course was fantastic and I want to thank Prof. Alison Rogers for organising it and Claire, Gareth and Bob for teaching us! I should also thank EPSRC and the IOP for funding the grant that allowed me to go – it’s wonderful that women in science wanting to communicate their research to a wider audience (or even just being better at communicating it to the academic audience they already work with) are being supported and encouraged!